It’s impressive what can be accomplished with a bit of creativity and thoughtful design. While most developers struggle to make complex controls work properly on the iPhone’s touch screen, EA Sports has practically pulled off a miracle by making a lengthy move set accessible on a button-less device. 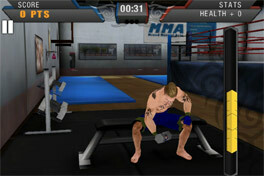 Through a variety of swipes, taps, and tilt motions, EA Sports MMA for iPhone puts the experience of mixed martial arts in your pocket. I admit to being apprehensive when first booting up the game, going through the tutorial, and learning that I was going to be expected to perform a host of fighting moves through tilt and touch. As mentioned, these schemes rarely work well. But as the tutorial progressed, it became clear that EA thought this through properly. Most of the moves are performed by swiping your thumbs across the screen, and these swipes all make sense. Swipe both thumbs down to do a takedown. Swipe toward your opponent to punch. Swipe both thumbs inward to lock up your opponent. When breaking free from a hold, two icons will pop up for you tap with your thumbs. After a few moments, it all feels natural and intuitive. The tilt controls also work quite well. Simply tilt toward your opponent to close in, or tilt up and down to dodge. Simple, but effective. 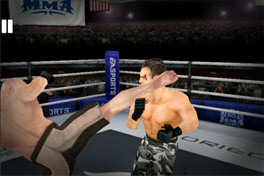 So now that we’ve established that EA Sports MMA plays well, it’s time to discuss its success as a licensed MMA game. Fight fans will be thrilled to find around three dozen of their favorite MMA stars to chose from and a huge selection of venues from all over the world in which to fight. And if that’s not enough variety, EA Sports MMA has a relatively robust fighter creation mode that allows players to choose their fighting style and tweak their fighter’s stats as they play through career mode. As impressive as the controls scheme is, almost as impressive is how much customization and how many options they’ve packed into such a tiny package. 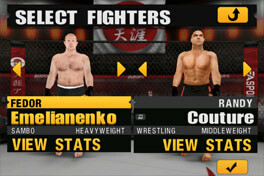 So impressive is EA Sports MMA, it’s hard to find anything to complain about. Be warned, however, that while the control scheme is impressive, the move set is quite deep, making the game one that won’t be easy to master. Making a few rounds through the tutorial is recommended, and after that it’s just a matter of learning the ropes by fighting your way through the ranks. Bottom Line: EA Sports MMA is one of those flagship titles that reminds players of the iPhone’s incredible capability as a gaming platform. With dozens of fighters and tons of customization options, the game is a testosterone-filled good time that fits in your pocket.